Hauppauge’s Media MVP-HD Digital Media Receiver, look like a Mac Mini/Apple TV, but doesn’t quite pull off the aesthetics. MediaMVP-HD is installed at your TV set and plays digital media (digital music, digital videos and digital pictures) from a PC or USB thumb drive onto a TV set. When digital content is on PC, MediaMVP-HD connects to your PC over home Ethernet network. You can also put digital media on USB thumb drive, plug USB thumb drive into MediaMVP-HD and then play content onto your HD TV set. MediaMVP-HD plays digital audio (MP3 music), high definition digital video (MPEG-2 as recorded by the WinTV-PVR or WinTV-HVR series of Hauppauge TV tuners, plus H.264 as recorded by the Hauppauge HD PVR and DivX) and digital pictures (JPEG, PNG, BMP and GIF). 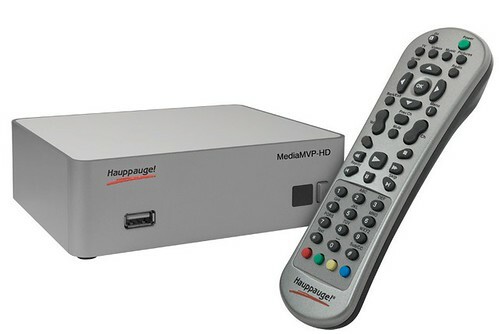 MediaMVP-HD comes with a full function remote control, with FastSkip buttons, a complete set of video control buttons (Skip forward, back, fast forward, pause, stop, etc.). And with audio volume adjustments, you won’t need your TV remote control just to adjust the audio.